ihobo: Wikipedia Knows Nothing - Out Now! 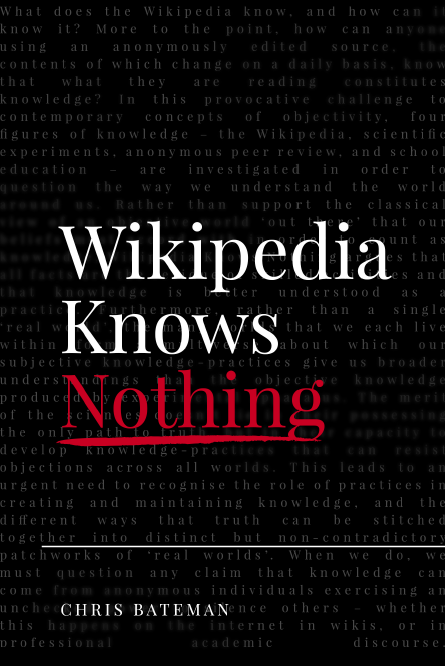 Wikipedia Knows Nothing - Out Now! What does the Wikipedia know, and how can it know it? More to the point, how can anyone using an anonymously edited source, the contents of which change on a daily basis, know that what they are reading constitutes knowledge? In this provocative challenge to contemporary concepts of objectivity, four figures of knowledge – the Wikipedia, scientific experiments, anonymous peer review, and school education – are investigated in order to question the way we understand the world around us. Rather than support the classical view of an objective world 'out there' that our beliefs must accord with in order to count as knowledge, Wikipedia Knows Nothing argues that all facts are the residue of skilled activities and that knowledge is better understood as a practice. Furthermore, rather than a single 'real world', the many worlds that we each live within form a multiverse about which our subjective knowledge-practices give us broader understandings than the objective knowledge produced by experimental apparatus. The merit of the sciences doesn't lie in their possessing the only path to truth, but in their capacity to develop knowledge-practices that can resist objections across all worlds. This leads to an urgent need to recognise the role of practices in creating and maintaining knowledge, and the different ways that truth can be stitched together into distinct but non-contradictory patchworks of 'real worlds'. When we do, we must question any claim that knowledge can come from anonymous individuals exercising an unchecked power to silence others – whether this happens on the internet in wikis, or in professional academic discourse. Purchase Print or eBook from Lulu.com, or Download for free.